We’ll be hosting regular OpenHours to highlight the work that the community is doing! Please visit the OpenHour tool documentation to learn more and join the call! This OpenHour will focus on Fido, a temperature alarm that sends you text messages, developed by RJ Steinert! Apitronics Kickstarter is Live! Check it out. 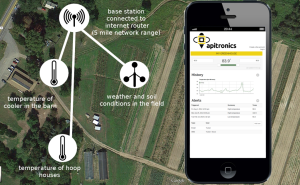 Apitronics is an exciting start-up of Farm Hacker Louis Thiery, originally birthed from a Farm Hack NH greenhouse monitoring project. The Apitronics Kickstarter is live, and it’s great! You can pre-order Apitronics monitoring “bees” and help Louis get off the ground at the same time. He’s already a quarter of the way to his funding goal – help out a fellow Farm Hacker and get a useful new farm gadget! Apitronics is a wireless platform designed for the outdoors. It includes a base station, or “Hive”, that coordinates a swarm of field-ready “Bees” which collect data and control switches. What a Bee does depends on what sensors or switches you attach to its waterproof plug. Apitronics will be releasing more plugs as the platform matures. 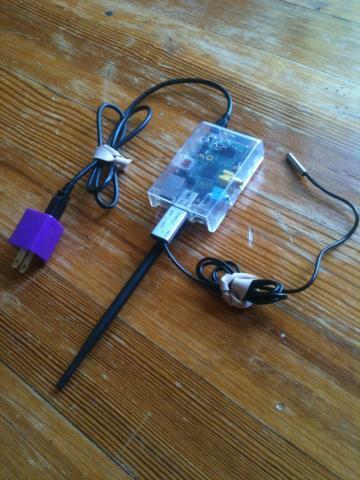 At one site, they are already doing some chicken coop monitoring, with a door sensor and a water level sensor. The system can send alerts if you forget to close the door or to bring water to the chickens! Through the Kickstarter, Apitronics is offering user-ready systems with Bees connected to weather stations or soil humidity sensors. Louis also hopes that other developers will build off the platform and that a diverse ecology of products and other solutions will be built around the open architecture. By bringing open-source to farm electronics, Apitronics hopes to see more innovative solutions that are more farmer-driven.